He worked like a dog protecting the TriMet system, riders and the broader community for the majority of his life. Now Officer Rexo is enjoying some R & R in retirement. Rexo served seven years on the Transit Police Division Canine Explosive Detection Unit. 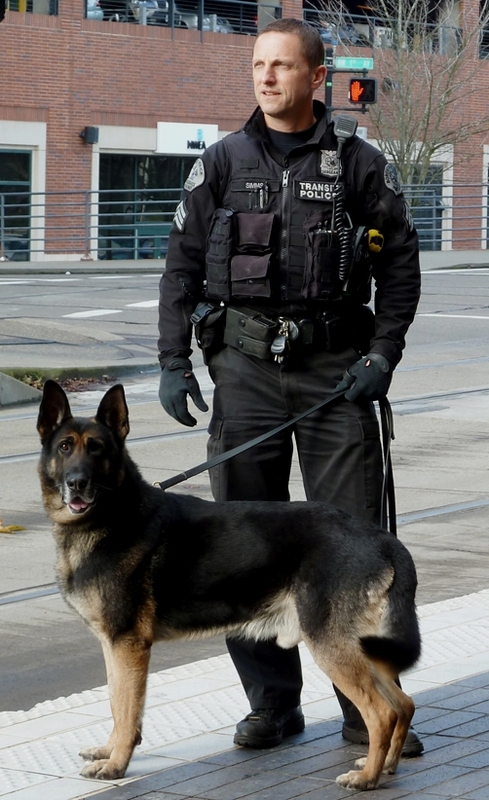 He has sniffed countless bags and belongings of TriMet riders, but his expertise has also helped keep the Dalai Lama, U.S. presidents, world-class athletes and others safe from those who might look to harm others. Both Rexo and the new officer to follow in his paw prints on the Transit Police Division were funded by the Transportation Security Administration (TSA). The TSA’s National Explosives Detection Canine Team Program partners with airports and mass transit systems to employ dogs as an effective and flexible tool to detect explosives on our transportation systems and, in turn, deter terrorists. The TSA provides TriMet with the money to purchase and train a dog as well as train the officer who handles the canine. Currently that’s about $50,000 per team. Rexo will remain with Sgt. Simms, his family and his new canine partner.